Charcoal rot, caused by Macrophomina phaseolina, is one of the important fungal diseases of strawberry in California. Macrophomina phaseolina is a soilborne fungus and has a wide host range, including alfalfa, cabbage, corn, pepper, and potato, some of which are cultivated in the strawberry production areas in California. The fungus infects the vascular system of the plant roots, obstructing the nutrient and water supply and ultimately resulting in stunted growth, wilting, and death of the plant. The fungus survives in the soil and infected plant debris as microsclerotia (resting structures made of hyphal bodies) and can persist for up to three years. Microslerotia germinate and penetrate the root system to initiate infection. Plants are more vulnerable to fungal infection when they are experiencing environmental (extreme weather or drought conditions) and physiological (heavy fruit bearing) stress. Soil fumigation is the primary management option for addressing charcoal rot in strawberry. Crop rotation with broccoli can also reduce the risk of charcoal rot due to glucosinolates and isothiocyanates in broccoli crop residue that have fungicidal properties. Beneficial microorganisms such as Bacillus spp. and Trichoderma spp. are also considered, especially in organic strawberries, to antagonize M. phaseolina and other soilborne pathogens and provide some protection. The role of beneficial microbes in disease management or improving crop growth and health is gaining popularity in the recent years with the commercial availability of biofungicide, biostimulant, and soil amendment products. In a couple of recent strawberry field studies in Santa Maria, some of the beneficial microbial products improved fruit yield or crop health. These treatments can be administered by inoculating the transplants prior to planting, immediately after planting or periodically applying to the plants and or the soil. Adding beneficial microbes can help improve the soil microbiome especially after chemical or bio-fumigation and anaerobic soil disinfestation. Similar to the benefits of traditionally used bacteria (e.g., Bacillus spp. and Pseudomonas spp.) and fungi (e.g., Glomus spp. and Trichoderma spp. ), studies with entomopathogenic fungi such as Beauveria bassiana, Isaria fumosorosea, and Metarhizium spp. also demonstrated their role in improving water and nutrient absorption or antagonizing plant pathogens. The advantage of entomopathogenic fungi is that they are already used for arthropod pest management in multiple crops, including strawberry; now, there are the additional benefits of promoting crop growth and antagonizing plant pathogens. In light of some promising recent studies exploring these roles, a study was conducted using potted strawberry plants to evaluate the efficacy of two California isolates of Beauveria bassiana and Metarhizium anisopliae s.l. and their application strategies against M. phaseolina. Entomopathogenic fungi were applied as 1X1010 viable conidia in 100 ml of 0.01% Dyne-Amic (surfactant) solution distributed around the plant base. To apply M. phaseolina, 5 grams of infested cornmeal-sand inoculum containing 2,500 CFU/gram was added to four 5 cm deep holes around the base of the plant. 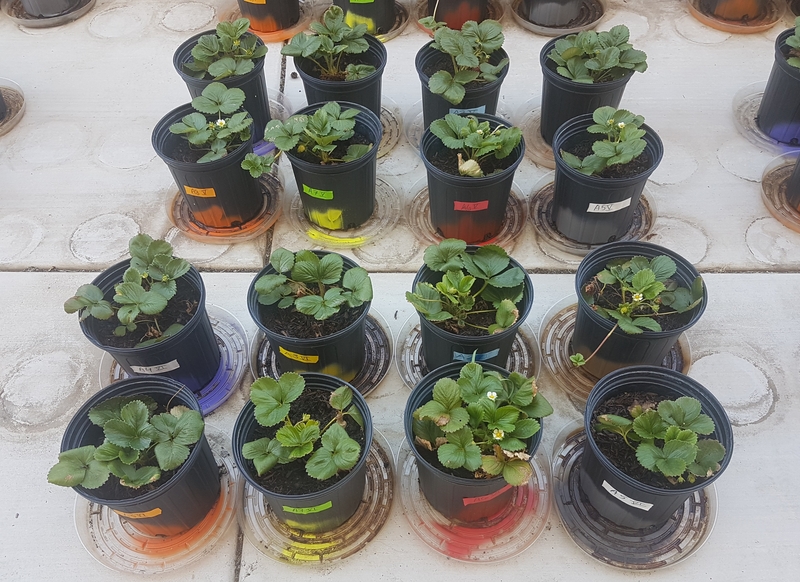 Each treatment had six pots each planted with a single strawberry plant representing a replication. Treatments were randomly arranged within each replication. The study was repeated once a few days after the initiation of the first experiment. Plant health was monitored starting from the first week after the M. phaseolina inoculation and continued for seven weeks. Plant health was rated on a scale of 0 to 5 where 0=dead and 5=very healthy and the rest of the ratings in between depending on the extent of wilting. Data from both experiments were combined and analyzed by ANOVA using Statistix software and significant means were separated using LSD test. The influence of entomopathogenic fungal treatments applied at different times as well as the combined effect of different applications within each fungus were compared for seven weeks. Ratings for some plants that were scorched from hot summer temperatures and died abruptly were removed from the analyses. Untreated control plants maintained good health throughout the observation period varying between the rating of 4.3 and 4.9. In general, plant health declined considerably from the 5th week after M. phaseolina inoculation. Plant health appeared to be slightly better in plants treated with entomopathogenic fungi, but there was no statistically significant difference in any except one instance. 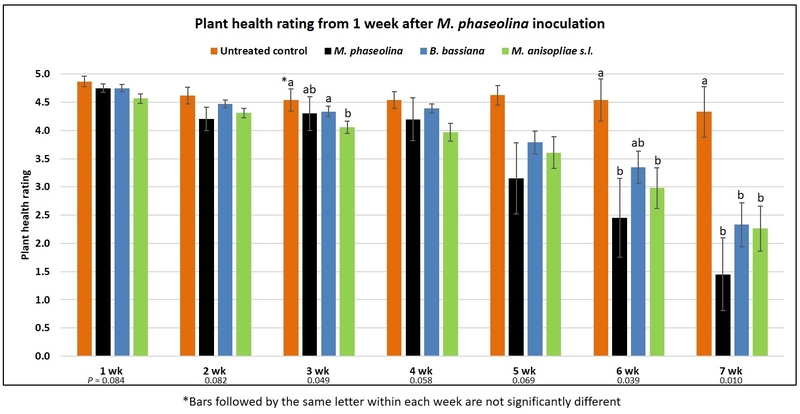 Plants treated with M. anisopliae one week prior to the application of M. phaseolina had a rating of 3.0 compared to 1.6 rating of plants inoculated with M. phaseolina alone. Plant health rating each week after inoculating with Macrophomina phaseolina. Bars followed by the same letter within each week are not statistically different. When data from different treatments for each entomopathogenic fungus were compared, both B. bassiana and M. anisopliae s.l. appeared to reduce the wilting, but the plant health rating was not significantly different M. phaseolina treatment alone. Influence of entomopathogenic fungal treatments against Macrophomina phaseolina when data from different treatments for each beneficial fungus were combined. This is the first report of the impact of entomopathogenic fungi on M. phaseolina with some promise. Additional studies under more uniform environmental conditions and with more treatment options would shed more light on this approach of using entomopathogenic fungi against M. phaseolina. The current study evaluated single application of the entomopathogenic fungi and we plan to conduct additional studies with multiple applications. Acknowledgements: We thank Dr. Kelly Ivors (previously at Cal Poly San Luis Obispo) for the pathogen inoculum and Dr. Stefan Jaronski, USDA-ARS, Sidney, MT for multiplying the entomopathogenic fungal inocula. Dara, S. K. and D. Peck. 2018. Evaluation of additive, soil amendment, and biostimulant products in Santa Maria strawberry. CAPCA Adviser, 21(5): 44-50. Vasebi, Y., N. Safaie, and A. Alizadeh. 2013. Biological control of soybean charcoal root rot disease using bacterial and fungal antagonists in vitro and greenhouse condition. J. Crop Prot. 2(2): 139-150.